For the second time in 2018, the UKBlues Federation are back at the wonderful deco venue, Worthing Pier’s Southern Pavilion. Earlier in the year for the inaugural UKBlues Awards sponsored by FORM Fit Out now back for the Fifth UKBlues Challenge. All Five Band Rose to The Challenge in Worthing – each of the challengers, Greg Coulson, Carl North & The Loney Hearts, Kyla Brox, Catfish and Tom C. Walker Band playing blues of many shades and tones that delighted the audience. Who though caught the Judge’s ears and are now excited knowing that in 2019 they will represent UK Blues at the 35th International Blues Challenge in Memphis in January 2019 & 9th European Blues Challenge in Ponta Delgada in the Azores in April 2019. What every organiser wants to see is a queue forming before the doors are opened. Tonight was one of those occasions as the sun began to dip tonight’s audience were waiting on the Pier for the doors to open and the event to begin. The atmosphere built as the venue filled. There was a buzz of anticipation front of the stage and nervous excitement backstage as the bands waited for the thirty-minute set that would decide their destiny tonight. The challenge every year has a special feel. This is not a traditional battle of the bands. The panel of five invited Judges, Sarah Reeve – Sarah’s Sussex Blues; Joe Cushley, (Music Consultant Radio 2 Blues Show, Presenter of Balling The Jack etc..) Alan White, (Early Blues and former board member); Malcolm Mills, (Chairman Proper Records) & Eric Nyberg (founder UnTapped Blues & Brews Festival in Kennewick WA; USA). With the judges listening with extra care the evening got underway as the first note filled the venue. Greg was the consummate showman as he delivered thirty minutes of fun loving Rock n’ Roll coloured with shades of blues and deepest soul. He divides his time between, guitar, keys and vocal duties. Greg opened the evening with warmth, smiles and a beguiling energy. This is a band you want to dance to. Despite having to cope with gremlins in his amp his guitar gave the tracks a sting, the keys under his rapidly moving fingers and dramatic playing and his vocals that caressed the lyrics He delivered a set full of animation. With numbers from his current album including Stitch Me Up, and his tribute to Steely Dan’s Walter Becker, Someone Be There. Greg and his band stepped up to the challenge as they got the judges thinking and had the difficult to task of being the first band of the 2018 Challenge. He set the bar would it be overtaken. Now we had an engaged audience who realised the bands may only have thirty minutes but they would deliver excitement into every number they had chosen for this very special set. Carl and his band have had a whirlwind as only a fortnight before the challenge they filled the final set on tonight’s bill. They qualified to perform their 30-minute set, by winning a challenge on the Jessica Foxley Unsigned Stage at the Great British Rhythm and Blues Festival in Colne. This young six-piece band from Manchester were jubilant they had never played their music this far south. As they stepped on the stage the audience leaned forward as for the majority this was the first time of hearing this band live. The set was full of raw energy, and youthful joy as we heard the saxophone for the first and last time tonight. With five numbers to impress the judges, they set off with Offguard. They certainly were on fire as the two vocalists took vocal duties and came together for some tasteful harmonies. The band’s drummer was superb as were all the musicians on stage. With Hard Times, (Not Stephen Foster’s Hard Times) a contemporary number delivered with a swirl of passion and they were weaving into their interpretation of the blues some country vibes. They may have been the wildcard having not been nominated by the nomination panel. Proving once again the depth of talent that often gets overlooked so it is a big thanks to all at Jessica Foxley for sending Carl North & The Lonely Hearts down South so we could enjoy the music. The third band of the evening took the tempo down with a four-piece that delivers gospel-infused blues. Kyla leads from the front in a splash of red as her vocals filled the auditorium of this Art Deco venue. Everyone in the audience was hanging onto every glorious note. She wove soulfulness into the delivery, packed a punch with emotional dexterity. You are so mesmerised and enthralled by Kyla’s voice you can overlook the talent of the musicians that provide the blues-drenched bass guitar from Danny Blomeley, one of the unsung musicians in the U.K. Kyla’s set exuded class and the audience were appreciative once again of the music and left like after the first two bands wanting to hear more. The fourth band and the rockiest tonight. Catfish delivered a set with a mix of new numbers including Ghosts from the anticipated upcoming album and the title track of the current album Broken Man. Catfish with guitarist Matthew Long and his father Paul on keys are renowned for long tracks at times whilst bounded by the blues and tip a hat at prog-rock. Many were intrigued by how they would cram their sound into a thirty-minute set. They did and the cheers for the local band were loud and warm. Many were disappointed that their personal favourite Let it Rain was dropped but that number is always long with its long guitar solos. We still had time to hear Matt’s guitar sing and his face make the varied gurning poses that characterises this young man who has a talent in making the guitar speak to you. Enough to attract the attention of the judges we will have to wait and see or was it one of the earlier bands? Or was the best yet to come with the final band? The long wait was over for Tom Walker and his band. At last they could take their place on the stage and play for the judges. Tom C Walker’s power is a double whammy with his stunning guitar playing and soulful vocals. Tom C Walker delivers soulful blues with a large helping of funk. It is a vibe that makes you smile and dance. Tonight, Tom and his band were tight, they were smoking and on form. The double guitars from Tom and Jack Cooper work exceptionally well together adding extra layers of tones and textures. The strong rhythms that hold the band together with imagination are Deano on Bass and Jack Bowles on Drums. The varied set was a delight and was a crowd pleasing collection. We all wanted to toast him when he finished his new number an ode to Tequila. Tom C. Walker is a young band that is growing in stature shaping the sounds to meet his and the expectations of the audience. This is another exciting set. What a way to close the night the bar was set very high by all five bands and we had been entertained by five bands that loved every second they were on stage. While we waited for the results the discussion was intense everyone had a favourite. But all that matters is what the judges say as the points are tallied and the winner decided we were kept occupied with the draw for the raffle. Four lucky people held the winning numbers for the prizes – A sleek White Fender Telecaster, donated by FORM Fit Out – Original Painting from the wonderful brush of Steve Pablo Jones:- UKBlues Federation Bag full of delicious CD’s and fourth prize pair of tickets any gig at Blues at the Woodlands in Gillingham, Kent donated by Andy Davies, who runs the club. Kyla Brox and her Band are of to represent the UK in 2019 at the 35th International Blues Challenge in Memphis in January 2019 & 9th European Blues Challenge in Ponta Delgada in the Azores in April 2019. Her stunning bright Red dress is outshone by the beaming smile as she gives a warm hug to Ashwyn Smyth the Chair of UKBlues Federation. She turns and the audience is bathed in the warmth of blues love that radiates from Kyla as she invites her band on stage. Is that it? With the certificate now handed over, and an engraved Trophy sponsored by Proper Music to follow? No of course not this is live music, this is the blues. Kyla Brox sings a winning number and then invites the other guitarists on stage for a guitar fuelled jam. The audience would have liked this to have gone on into the night but as every venue’s curfew rules and the music fell silent and we left to walk down the pier discussing the evening and the power of live music. 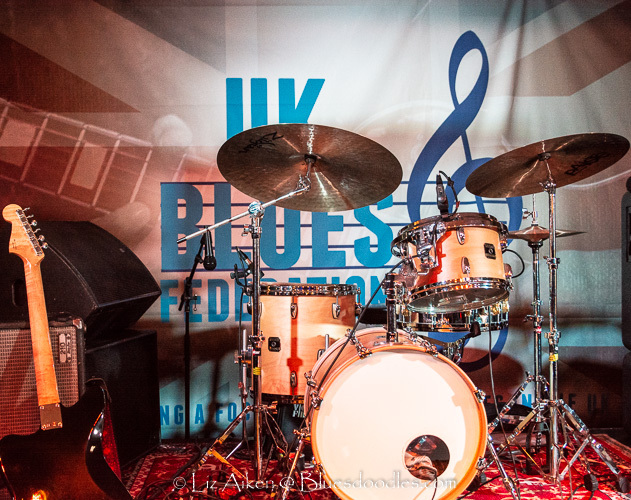 Have been at the four Challenges that the UKBlues Federation has organised, this is the best challenge yet, organisation, bands and pure blues music family vibe as musicians joined the winning band to celebrate UKBlues with the UKBlues Federation.